I was sitting at my computer last night, browsing a lot of AWESOME manis from some of my favorite bloggers, and I was so inspired that I just HAD to do a nail art manicure. But this time, when I say nail art, I mean NAIL ART. I've done some cute and easy designs lately (which I obviously think are great), but this time I really wanted to do a complex freehand design that would challenge me. I wanted to sit down and spend HOURS on a design! Overall, I'm super happy with it. I especially love the scenery part on the two nails on the right. My only regret was not sketching this out first -- I think the two big fish on the left got a little crowded. Oh well! Let's just pretend that they're besties and want to cuddle together. Cool? Cool. 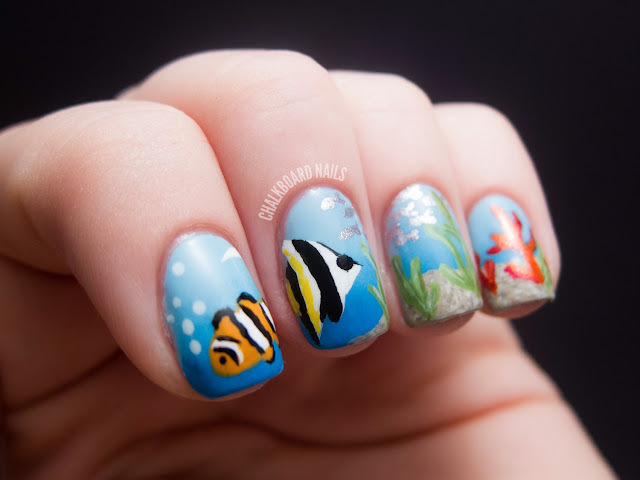 As you can see there is a little clownfish on my pointer finger. If you want to pretend that it's Nemo or Nemo's dad, I'm okay with that! The black and white fish is apparently called a long fin bannerfish. I liked the long arcing top fin (you can see it continue on to my pointer finger). There are a lot of colors in this. I don't want to shortchange you guys though so I'm gonna try to go through them! I hope that list makes you realize how much I love you! I did this nail art primarily with a medium length striper brush and a needle for some of the finer details. 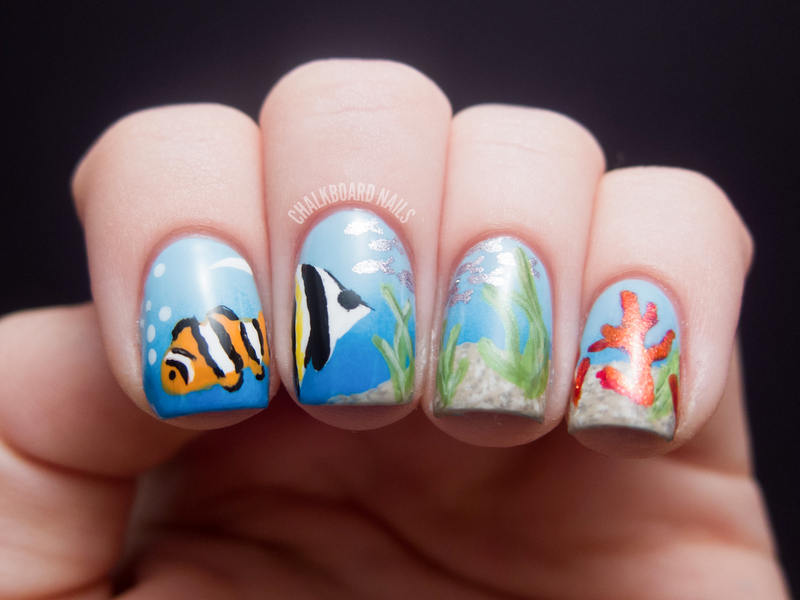 I did use a dotting tool, but just for the bubbles by the clownfish. I really love freehanding and I hope to make a more conscious effort in the future to do labor-intensive and skillbuilding designs like this one. This is absolutely amazing! Your freehand work is gorgeous, I wish I had 1% of that talent! One of my favorite manis ever...keep the great work coming. Amazing, They are very Pretty. Wow! You did an awesome job! I couldn't even begin to attempt anything like this! Amazing freehand skills! Wow that is incredible! You did a fantastic job! Can't wait to see more of your incredible talent! I love your blog and check it daily. You inspire me to try new things all the time! Thank you! Looks amazing! :O I'd never have the patience for something like that. Fabulous design, I'm sure one of my all time favourites for a long time! Eeeee! I LOVE underwater scenes, and you did such a great job! I painted my mother's bathroom in her house with an underwater scene, and my coral and seaweed looked something like that. Much bigger, though, you did great and on such a tiny canvas. Excellent! Wow, I had idea you could do nail art like this! Amazing job, seriously. Sarah! Holy crap! I saw your "mess" picture on Instagram, but I had no idea this is what it was shaping up to be. What truly amazes me is that it's ALL polish. Your skills have really shot above almost every blogger's I read. Totally awestruck! This is totally amazing! stunning! I love it! The sand and the seaweed look so real! Unbelievable! I am absolutely amazed by these! That is such a great detailed design going on and you did it so well! Your freehand skills are incredible! holy gorgeous. This is incredible. I'm in awe of you. I am dying with how gorgeous this came out! You are amazing! Amazing design, you did a fantastic job! Absolutely stunning, you did an amazing job on this! The last time I did scenic nail art (that's what I call it! haha!) was when The Lion King was rereleased/when I was still new to nail polish/nail art, so this really makes me want to try it again. This turned out sooo amazing, but I had no doubt it would! :) You're so talented, Sarah! I hope you keep that on your nails for at least a couple days so that you can really enjoy it. Love this so much! I can't get over these Sarah, WHAT. And I love the cuddling fishies. I'm a big fan. Ug. Stunning. That is some fabulous art work. My favorite color is the Butter London you picked for the school of fish. It brings an interesting & contrasting sheen to your work and it's awesome. I have a question for ya, when you sit and do incredible nail art like this, do you do both hands? I usually try to do something similar/related but less complicated on my other hand. I truly had intentions to continue the scenery on my other hand, but by the time I had finished my left hand last night, it was way too late to start art on my right hand (damn you full time job!). So right now it just has the gradient on it. Perhaps I will add something later! Oh my gosh, you are completely right! I didn't even think about the fact that the other fish is like Gill (I just looked up his name)! How funny!! This is INSANE! Awesome job! Awesome! I love it, you're so talented! This is truly great! Awesome work Sarah! I am so jealous of your talent ♥! So gorg. I especially like how the coral turned out, with that perfect coral texture. That's really amazing! Wish I could do that and yes I'm pretendIng that's Nemo :) keep up the great work. Don't have anything to say, this is SO freaking STUNNING! Well worth the time you spent on it! Beautiful! I LOOOVE it! 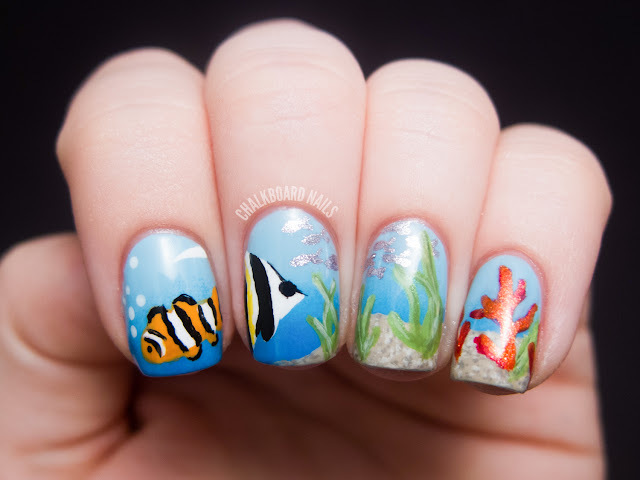 :) The orange clownfish is absolutely amazing. LOVE it!!!! Unda da seeeeeaaaaaaa!!!!! Holy crap! That brown sea bottom looks like a photoshop texture piece. So awesome. you are seriously talented and this look so amazing! loooooooooooooove it! I love this! Maybe I'll have to try one like this. It looks so cool! I can't believe you did all this with polish!!!!! This is so STUNNINGLY magnificent I have no words!! <3 I love it. WOW!! This is SOOOO AMAZING!!!!! Btw, your drawing are not inaccurate at all. They pretty much work together in nature. This is definitely has to be a salt water scene, which means that the green is probably another type of coral and not exactly algae, but it looks great and real and SUPER AMAZING!!! I love this!!!! Amazing, as always!! I LOVE this!!! How does the coral look so real!?!?!??! That is seriously amazing. AMAZING. That is the only thing I can think of to say. 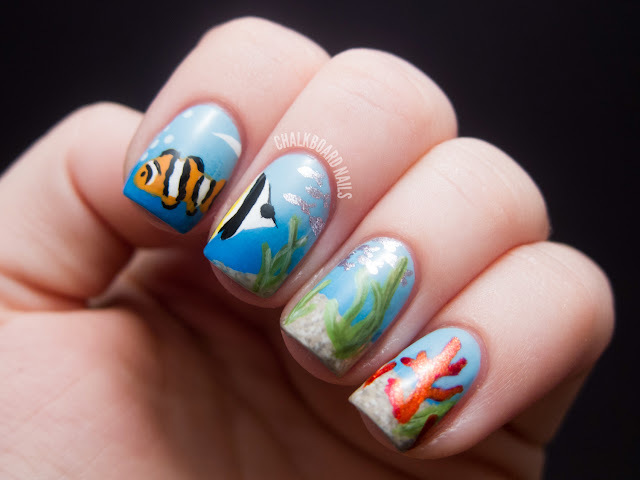 I've seen a lot of blogs and a lot of nail art...and that seriously has to be one of the best designs I have EVER seen. Also, is there anything on your thumb?! If so, I wanna see it! Also, also...what did you do on your other hand. And don't tell me the same thing, or I am throwing all of my polish out the window and giving up! My thumb has more little bubbles like on my pointer. My other hand just has the gradient. I meant to continue the seaweed and coral scenery but I had to get to sleep! This really triumphs everything I've seen! They look like a photo!! Gorgeous! You did such a fabulous job like always! I don't think the fish are crowded. They are too cute! Really impressive! Thank you for sharing! This is utterly AMAZING Sarah!! Aw Sarah! This is absolutely beautiful! This is the most amazing manicure I've ever seen! Gorgeous! As a scuba diver as well as a nail polish addict, I have to say this is the best. mani. ever. I am totally pinning this!! I would love to be able to do this, but unfortunately, I don't have the skills. I am just happy to admire your beautiful creation! Great job!! OMG, I thought at first that you did this with acrylic paint... But no way! Your work is absolutely stunning, you are so skilled! It really makes me wanna try this kind of complex nail art more! so pretty! you did an outstanding job! omg!! your designs are definitely the best! These are amazing! Defintely ones of my favorites. Keep it up! Wow, these are just amazing. I definitely need to get more creative with my nail art! Completely gorgeous! For some reason the colours you chose for the coral really caught my eye, so beautiful! Great job! wowza!!!! this free hand is amazing! This looks so cute! Amazing work!